• Blanch spinach leaves for 20-30sec in boiling water. Transfer immediately to a bowl of ice cold water and let it for 5minutes and drain. • Similarly blanch tomatoes, peel the skin and chop roughly into medium chunks. • In a dry pan saute onion, ginger, garlic, chilli, whole garam masala, jeera till onion is slightly translucent on a medium low flame (it may take about 4-5minuts). Let it cool down. • Grind the dry roasted onion, ginger-garlic, garam masala, jeera, chilli, cashews, tomatoes and spinach to a fine paste and set aside. • Heat oil in a nonstick pan add pumpkin and saute for 5-7minutes and then add salt, turmeric, chilli powder and let it simmer till the raw smell leaves. Serve with roti (link) or Kulcha (link). 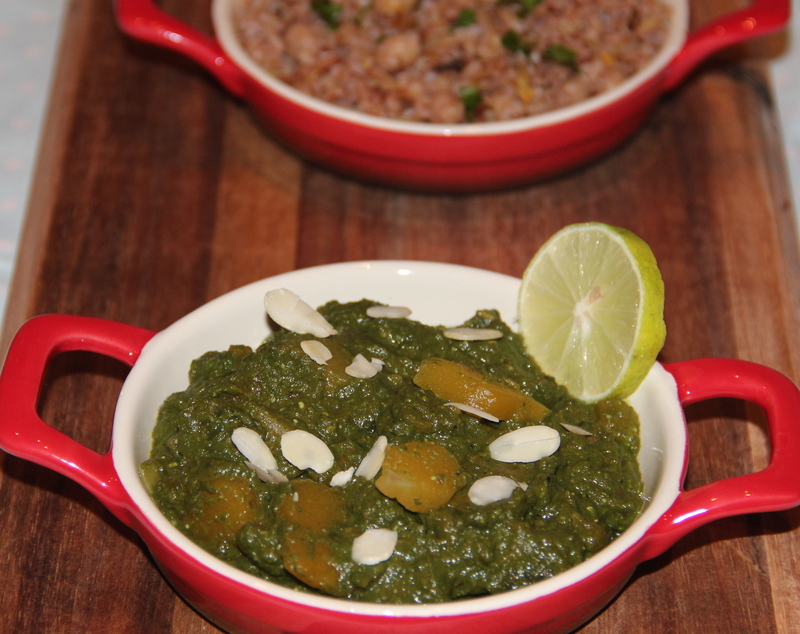 Posted on September 21, 2014, in Indian, Side dish and tagged Chitras healthy kitchen, drchdietfood, Indian Gravies, Indian sidedish, Pumpkin, spinach. Bookmark the permalink. 1 Comment.